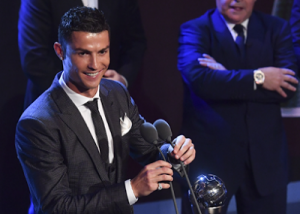 Cristiano Ronaldo wins 2017 Best FIFA Men’s Player Of The Year award – Royal Times of Nigeria. 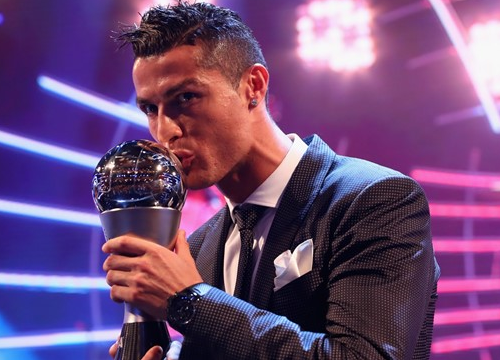 Cristiano Ronaldo has been named the 2017 Best FIFA Men’s Player of the Year at a star-studded ceremony in London on Monday. The Portuguese forward, who won last year’s inaugural award, fired Real Madrid to the La Liga title and scored 12 goals as the Spanish giants won the Champions League. Real Madrid’s Zinedine Zidane was awarded the Men’s Coach while Dutch duo Lieke Martens and Sarina Wiegman were rewarded as The Best FIFA Women’s Player and Women’s coach. FIFA FIFPro World11: Gianluigi Buffon; Dani Alves, Leonardo Bonucci, Sergio Ramos, Marcelo; Toni Kroos, Andres Iniesta, Luka Modric; Cristiano Ronaldo, Lionel Messi, Neymar.